[IKI SHI TAI] is the most playful introduction to modern dance that you can imagine. The collaboration between three Japanese dance geniuses result in a versatile and entertaining show. The dancers give their performance with infectious fun and see why they let this go on a blind date this month tour in the Netherlands can do. For dance fans, there is perhaps too little dance spectacle, but by the space now for humor and fantasy [IKI SHI TAI] suitable for a wide audience. All three dancers have earned their stripes in the European dance scene. Shintaro Oue (1975), the originator of the concept of [IKI SHI TAI], among others danced with the Hamburg Ballet and the Dutch Dance Theatre and is an international freelance choreographer. For this series Blind Date collaborates with dancers Masahiro Yanagimoto (including Scapino Ballet, Conny Janssen Dances and Galili Dance) and improvisation phenomenon Kenzo Kusuda. At first glance [IKI SHI TAI] a mix between mime, dance and acrobatics. Dance has this not the biggest share, but there is a lot of humor in front. The Japanese men babble at each other and constantly make cartoonish sounds and noises that are typical for fighting cartoons. You would not expect from dancers, but funny it is. In [IKI SHI TAI] running performance to three boys, friends or brothers, who on an empty stage play with each other, tease each other and their tricks. After the first part of the show contains few pure dance, there are some moments when half the men show why they dance in the Blind Date series deserve. Short choreographies are smoothly strung together and interspersed with frolicking and fighting. The sweat stains in colored shirts of the men to read how much physical strength there is in this performance, even though it all seems so light and playful. Besides the youthful romp of the dancers, there is a somewhat vague philosophical thread through the show around the theme of ‘the breath’. When the audience enters Kenzo Kusuda sitting on the floor in Japanese monologue to keep the breathing of people. Later in the show does Masahiro Yanagimoto the text again, but now in English.While he casually tells the public how it is with the breath, the other two dancers stalking him to lose his balance and maneuver him into various positions to which he must interrupt his monologue. It delivers a witty scene, but the link with the rest of the performance is hard to find. This theme of what is superfluous breath, air and wind, however, get to a subtle climax because at the very end of the show hundreds of plastic bags by fans on the playing surface are blown. For children [IKI SHI TAI] undoubtedly also very suitable, they will recognize themselves in the fictional battles against the three men and with each other against an invisible opponent run. The adult observer of [Iki Shi Tai] will be pleasantly surprised to see that modern dance and humor so well together. 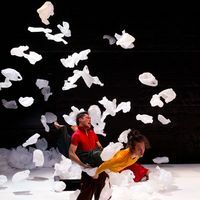 The combination of acrobatic modern dance techniques and childlike imagination makes this show for young and old, experienced and inexperienced audience a cultural treat that you should not miss. [IKI SHI TAI] is in the month of March 2012 in the Blind Date on tour.For the playlist and the trailer of the show’s website Theater Blind Date. Avobe originally in dutch, written by Claire Goossens. Everything is relative in this world : what is big , small , strong, weak , securely and uncertain. The proportions vary depending on who is viewing and challenge them - the view can also be culturally determined . Shintaro Oue , Japan born dancer and choreographer who among other things has worked for the Cullberg Ballet , operates a number of years C/Ompany , who gladly puts physical laws and cultural codes of play in acrobatic dance works . 2010 collective amused the audience with " [= equal ]" where cultural stereotypes were turned around in violent tours. Two years later came " Iki.Shi.Tai " as the basis of Japanese culture - or our prejudices about it - bad meditative and equilibristic movement art with humorous and self- ironic twist. New section " Protocol Relating to the status of the bucket and rope" spinner on the operating concept - a series of martial arts similar showdowns where the energy migrates from body to body in a sweaty battle for territory , leading to comedy. If fans last time was attribute is it this time buckets and ropes of various sizes that may be co-players in the playful , sometimes violent shifts. New, and shortest , the gang is Naoya Aoki which may act tease but also stoically endure - like when he was kneeling in a bucket sings a song in Japanese while the rest of the trio get into a flowing choreography with yet another bucket of the fourth part . When Shintaro Oue itself enters it with a thick rope around his neck , an ambiguous image that is reinforced when Masahiro Yanagimoto forcing him to stand on his hands . In contrast shows Naoya Aoki how he mastered the small , thin rope in his tricks . Circus disciplines transform however anarchic mischief when the quartet wild whooping as the samurai to pasture (all wearing green patterned lounge pants ) challenge each other to the audience . Despite subtle whim feels " Protocol Relating to the status of the bucket and rope" not as an evolution of the group since the last time . They spoke elements are weakest and even physically there will be some wrestling matches and trying to outdo each other too much. Nevertheless, it is an enjoyment when the flow of complex physical assistance is performed with such ease , timing and expressive humor (although Shintaro Oue grimacing bad due to a back injury ) . The interplay is tight like a jersey. C/Ompany has laid claim to its own niche : a group of dancing clowns with cultural twist.